85 out of 100. Incorporating 650+ ratings and reviews. The drive, blend and level knobs give you more control over the preamp section, which lets you decide between subtle coloration to full out grit. Giving this preamp vintage style tube tones is Behringer's V-Tone modeling technology, which digitally replicates the sonic flavors of different amps, controlled via the Drive knob. Dimensions: 2" x 5" x 3.9"
While this preamp pedal is obviously aimed at entry-level players, even experienced musicians found themselves impressed with what the pedal can do relative to its price. 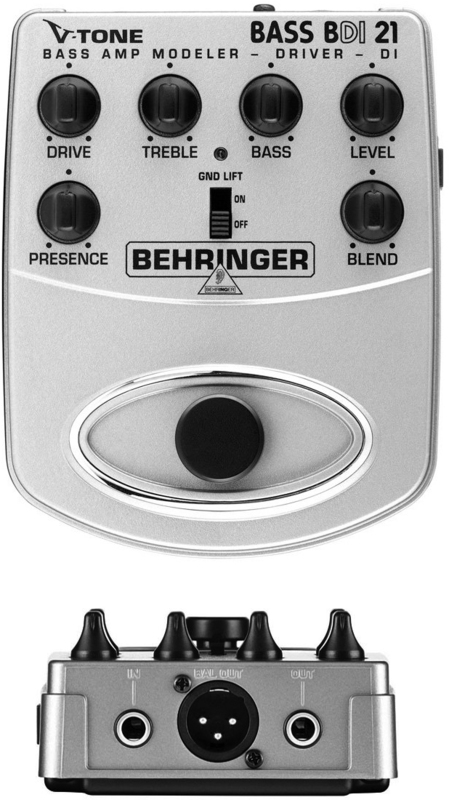 Some even go so far as to state that the Behringer V-Tone Bass Driver should be a standard equipment for all upcoming bass players. Reviewers point to its sound quality as its best feature, with some even attesting that it has comparable sound quality to more expensive preamps. The most common complaint about this pedal is its plastic top plate and footswitch, but this is to be expected given its affordability and weight. A few others commented on the lack of a middle frequency EQ knob, which would've allowed for more tone shaping control. As long as you handle the Behringer V-Tone BDI-21 carefully and don't stomp on the footswitch like crazy, then this is the perfect budget bass preamp for you. To find out which bass preamps we recommend, take a look at our guide to The Best Bass Preamps.